It is generally accepted that a conducting lessons learned meeting or a project post-implementation review at the end of a project or phase is a best practice.at the close of a project or phase. However most reviews are ineffective because they do not collect actionable information. A constructive post-implementation review that produces actionable lessons learned. Institutionalized learning where the universal truths are actively communicated and applied across the organization. In other words, ensuring that the lessons and universal truths become part of the organizational DNA. This article focuses on facilitating the closing process meeting and identifying the lessons learned. Future articles will discuss distilling the lessons and institutionalizing them. Meetings that devolve into the intricacies of that particular project. 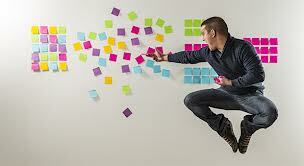 Jumping to solutions before the issues has been clearly defined. Finger pointing and blame shifting. I have found that by proactively facilitating the project review meeting, it is possible to collect actionable information and leave the participants feeling good about the process. The two methods that I frequently use are: the Crawford Slip process, and a directed questioning technique. The Crawford Slip process is a commonly used and effective brainstorming technique. I use it to collect requirements, develop mission statements, and collect feedback on projects. The technique is designed to quickly elicit and prioritize a large amount of information from a group. When the team comes to the meeting, I tell them that most of the meeting will be conducted in silence. I give each participant several Post-It Notes® and ask them to list their thoughts about the project, with one idea on each Post-It. In general, I ask for feedback as a neutral, open-ended question. When everyone has stopped listing their thoughts, I then go around the room and ask each person to share one of their ideas out loud, and then post it on the wall. At this point, the notes are posted randomly on the wall. We go around the room until all of the notes are posted. I then ask the participants to go to the wall and begin organizing the ideas into lists, which is also done silently. Once all of the notes are organized into like columns, I read all of the notes in the list and ask the team to label the column. After all of the columns have been labeled, we step back and discuss the major themes that have emerged. These themes are the feedback or lessons learned from the project. I use the Crawford Slip technique in many settings. By conducting most of the process in silence, all participants have the opportunity to express their thoughts in a non-threatening environment. The facilitator can easily control the flow of the meeting and avoid most of the common meeting dynamic issues. In an hour-long meeting with 10 participants, this technique can generate 50-75 ideas that can be categorized into 5-10 categories. These categories can form the basis of the universal truths or be the starting point for a subsequent deep-dive meeting. The directed questioning technique is most effective when reviewing a troubled project. In this technique, the facilitator asks focused and directed questions to the team. Posing the questions in a binary (yes/no) format is one way to avoid distractions or ‘red herring’ conversations. For example, I was the external facilitator for a post-implementation review for a project that experienced a software defect shortly after it was deployed into production. The review was critical because the team had started another project that was already experiencing challenges. “Was there a requirement to change the data feed?” No. The primary scope of the project was improving system performance. “Did the analysis/design document include the change?” Yes. The development team documented the change to the feed; but the impact was not understood. A design review was held, but no concerns were raised. “Was the missing data element identified during testing?” Yes; but the tester failed to raise this as a defect. “Was there a thorough review of the test results and open issues prior to the Go decision?” No. The approvers were not aware of the defect when they made the Go decision. By driving the discussion, we were able to uncover a breakdown in basic project controls. For the subsequent project, we added additional oversight to ensure the standard processes and controls were followed. The primary goal of the closing meeting is to gather actionable information. Of course, it’s best if the team also leaves the meeting feeling good about the process. A well-facilitated review session can achieve both of these goals. I have found both the Crawford Slip and directed questioning techniques to be effective for achieving these dual goals.